When I first came into recovery the thing that really killed me was realising that my thinking was haywire – that I was generally wrong about everything. My ego was devastated by this newly apparent reality. I had long prided myself in always being the smartest guy in the room often dismissing other people’s views on things. Generally I always thought I was right about practically everything and what I did know was hardly worth knowing. I found out my dismissiveness was linked to my insecure attachment. I ended up being intolerant, arrogant and dismissive of others. It kept others at arm’s reach because I didn’t trust them. The echos of childhood can reverberate for decades afterwards. So finding out I was often completely wrong about stuff was devastating? How could I be so wrong about stuff? Especially I had built up over a life this façade always being right? My counsellor asked me once “Would you rather be right or happy? “Right of course” I replied. I was rarely right about anything in the first months of recovery. I could not grasp why I was so often wrong, how I kept completely misperceiving events or mistinterpreting people, their facial expressions, their tone of voice. I would recount something to my sponsor, he would listen and then give the version of events that actually occurred. I despaired that I had turned into a cretin somehow? When at wit’s end, this former intellectual genius was illuminated one day. One day after group therapy in treatment – where 10 complete strangers take seeming delight in telling you who are really as opposed to who you think you are – I was walking in a local park when I suddenly had this revelation that my thoughts were always leading me to a place of emotional pain. It was as if my thoughts were out to get me, had sort of stopped working for me and had decided to work against me instead. The thoughts seemed to be the voice of a really negative self schema, mixed with my alcoholic voice that just wanted out of this strange alien world of sobriety and thought it would hassle me until I succumbed. A world full of people who scared me, whom I did not trust. I did not know how the hell to cope with this world sober and it scared the hell outta me. The thoughts were fraught, negative, self loathing, they seemed to contain fragments of the reasons why I drank in the first place and the reasons why I drank years after. There was a maelstrom of unresolved issues and negative ideas of self mixed up in a strange brew with the motivation voice of my addiction which just wanted to drink. It was no wonder I drank, with this discordant cacophony of mangled thoughts and harsh voices blaring way. When I rang my sponsor, with news of this revelation , he was so delighted for me. At how I had managed to disassociate me from these thoughts. He said these are the thoughts of your illness. This had been my illness constantly jibbering away, trying to demoralize me.. He told me the 12 steps would help deal with these thoughts although they never go away completely. It was such a breakthrough in early recovery. It is one of the main reasons I am alive today. I had realised there was this addicted me, living upstairs like a fanatic in the attic, which was distinct from the new, recovering me that would have to try my best to ignore it. This has become easier as recovery has progressed. My illness and it’s lies, it’s quite convincing chatter lives in ME, the parts of my brain that deal with self, especially motivational parts of the brain. Hence I have to be careful of wanting or desiring stuff as the thoughts and the chatter get turned on again. If I turn my will, my thoughts over to my HP then serenity prevails. I have to be aware of Me. Me. Me. I have to be aware of thoughts which have me, mine, or I in them. If my thoughts have me, mine or I in them then I am lending my ear to my illness again. This stuff is a difficult thing to come to terms with – it is similar to egodystonic thoughts in OCD sufferers – thoughts in conflict with a person’s ideal self-image – but when you do grasp this you are well on your way to recovery! 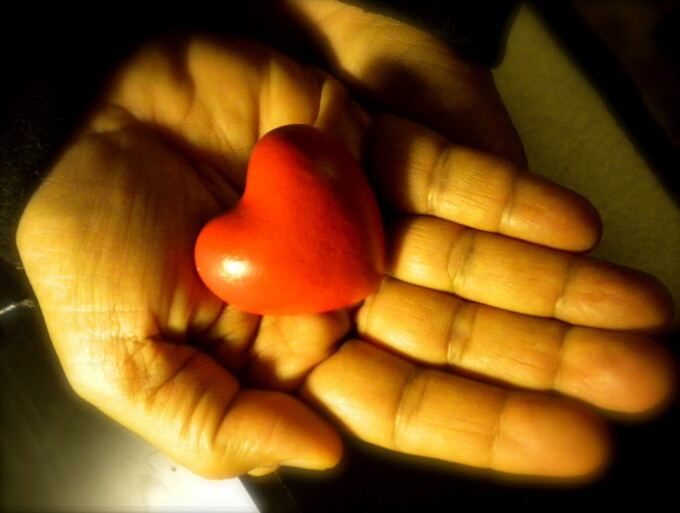 Your Heart is in Your Own Hands! I give myself a hard time, it is a habitual response I have when things go “wrong” or don’t go my way. One of the first words that pop into my head is “idiot!”. It is a lack of distress tolerance borne out of a reducee ability to deal with fristration. This appears in the brain as a distress signal prompting an automatic response rather than an evaluative response. A reaction rather than a reflective action. It is the consequence of a distress state and in itself distressing. It can also be distressing for those around me. It seems like perfectionism which is also a product of distress. I believe it is also the product of my upbringing, trauma and insecure attachment which has led to a low self esteem and a lack of self soothing combined with the reality that chronic alcoholism leaves us with an allostatic brain, i.e. the stress systems in the brain are impaired. It is only recently in recovery, after some years of recovery, that I have started to feel real compassion for myself as someone recovering from alcoholism and various addictive behaviours. When I look at photos of me in active addiction and in the first years of recovery my heart goes out to that younger, more distressed version of myself. Compassion is a Latin word that which can be translated as meaning suffer together with. It can also be described as a feeling of empathy for the suffering of other people. I have always found it easier to have compassion for others more than myself. I practiced Buddhist mediation for a number of years and have often felt at one with the world and it’s people. I have nonetheless always struggled with being compassionate towards myself. I have somehow found myself undeserving of a compassionate attitude towards my own struggles. I know my God loves me but I have often felt it difficult to love this person that God loves. Again, this could be a legacy of how ambivalent attachment and how my mother saw and reacted. I sometimes have more time and consideration for others rather than myself. Ultimately however, how react to the world is a function of how I treat myself and the attitudes I have collected in my negative self schema or the neural responses ingrained in my brain over decades. As the image below shows, my heart is in my own hands, by this I mean the distress I experience in life is the consequence of my own attitudes towards me and my fellow human beings. We have had a neuroscientific “decade of the brain” so perhaps we need a “decade of the heart”? As we say in recovery circles, recovery is a journey from the head to the heart, which is so true whatever way you care to look at it. This study (1) looked at “Self-Compassion Amongst Clients with Problematic Alcohol Use”. “Self-compassion is a topic of growing research interest and is represented by six facets including selfkindness, self-judgement, mindfulness, over-identification, common humanity and isolation. Recent research interest has begun to examine the use of self-focused compassion and mindfulness as a way of alleviating the distress associated with psychological disorders. Recent research interest has begun to examine the use of self-focused compassion and mindfulness as a way of alleviating the distress associated with psychological disorders. The self medication hypothesis (Khantzian 2003) suggests that substance addiction functions to self-soothe and to modulate the effects of distressful psychological states (Suh et al. 2008). Other research has found that experiencing stressful life events significantly predicts the amount and frequency of alcohol consumed (Dawson et al. 2005) and the onset of alcohol dependence (Lloyd and Turner 2008) indicating that stress plays a key part in the development of alcohol use disorders. Low self-esteem has also been found to pose a high risk for substance abuse (Baumeister 1993; Bushman and Baumeister 1998) and alcohol dependence (Chaudhury et al. 2010,). Self-compassion does not involve an unrealistic self view, it should be stable unlike self-esteem, which often fluctuates (Kernis et al. 1993). Self-compassion involves being kind and understanding to oneself, awareness that pain and failures are unavoidable common experiences among humanity and a balanced awareness of one’s emotions (Neff, Rude and Kirkpatrick 2007). Kelly et al. (2010) suggested that the trait of self-compassion promotes adaptive functioning and appears to provide a buffer from emotional distress. Neff (2003a) has also reported that self-compassion was strongly inversely related to psychological health such as depression, anxiety, rumination, thought suppression, self-criticism and neurotic perfectionism. Neff, Kirkpatrick and Rude (2007) found that increased self compassion resulted in reduced depression, anxiety, thought suppression, rumination and self-criticism. Neff (2003a, b) suggests that there are three main components to self-compassion including self-kindness versus self-judgement, common humanity versus isolation and mindfulness versus over-identification. Self-kindness is being kind to oneself rather than judging harshly or being self– critical. Common humanity is viewing one’s experiences as part of larger human experience and not viewing them as isolating or separating. Mindfulness is paying attention in a particular way involving a conscious direction of awareness (Kabat-Zinn 1994). Neff (2003a, b) describes mindfulness as taking a balanced approach to negative emotions and neither suppressing not exaggerating emotions. The self-kindness facet represents an alternative to rumination, blaming, self-condemnation and self-criticism. Common humanity appears to be related to general well-being and Mindfulness represents a state of mental balance with a stance of composure towards difficult and painful thoughts and feelings, therefore suggesting mindfulness may play an important role in adaptive and maladaptive emotion regulation (Van Dam et al. 2011). Self-compassion can be thought of a coping strategy that assists one to remain emotionally balanced when in a stressful situation (Rendon 2007) and provides emotional resilience (Neff 2011). This study is among the first to examine the self-compassion of people with alcohol dependence, who were currently using alcohol at hazardous levels. The results indicated that the (alcohol dependnet) participants in this study were significantly lower in mindfulness, common humanity and self-kindness than what would be expected in the general population. Participants were also significantly higher in over-identification, perceived isolation and self judgement than the norms for general population. Stress was found to be significantly negatively correlated to the overall score for self-compassion (e.g., the higher the level of stress reported by the individual, the lower the self compassion). Stressed individuals judged themselves more harshly, felt more isolated from others and felt overly responsible for negative events that occurred in their lives. The results ,taken together, indicated that participants in this study reported a significant increase in self-compassion, mindfulness, common humanity and self-kindness between baseline and 15-week follow-up and involvement in treatment with a Drug and Alcohol Clinical Service. Additionally, there was a significant decrease in self-judgement, isolation and over-identification. The reduction in self-judgement and isolation was such that at the 15-week follow-up stage, participant scores for these subscales were equivalent to what other research has suggested is representative of the general population. This study is useful in that it shows how the emotional distress at the heart of addiction, itself a manifestation of altered stress responding or heightened stress responses in alcoholics, was greatly reduced by self compassion or simply have a more compassionate view of one’s suffering. It is in taming the distress of the heart that lowers stress chemicals swirling around the brain and which influences our subsequent attitudes and behaviour. Recovery is in the heart, in the now, in not reacting but acting. Even if that action is just of observing, paying attention to, having compassion for. After years of being our own worst enemy, perhaps recovery is the process of becoming our own best friend. 1. Brooks, M., Kay-Lambkin, F., Bowman, J., & Childs, S. (2012). Self-compassion amongst clients with problematic alcohol use. Mindfulness, 3(4), 308-317.